Rissa Watkins > Blog > Blog > Happy 6th Re-Birthday To Me! Today is my 6th re-birthday. Six years ago I got the bone marrow transplant that saved my life. I can’t believe it has been 6 years. It seems too short a time for what I have gone through and yet seems so long ago when my whole life changed. I watched Mamma Mia during my transplant. I was higher than a kite while on morphine and apparently was belting out Dancing Queen so loud the nurses could hear me at their station. I watched it again today and as I was singing along to Dancing Queen, I just lost it. I am so blessed to be alive and I don’t take that for granted. But I have been through so damn much in these 6 years and the 6 months preceding the transplant when I was first diagnosed. It all just hit me while singing that song. I was in the hospital for 44 days after the transplant trying to recover enough to be able to go home. Two months after the transplant my father passed unexpectedly. I am so thankful the test results came back saying the transplant was a success just days before he passed. Fourteen months later my father-in-law passed from the cancer he got from Agent Orange. My family faced 3 devastating loses in 3 years. Yes, I count myself as one of those losses. The old Marissa is gone. A new one was reborn. It has not been an easy journey. Seems like every year I gather more rare or major medical problems. This is not the life I thought I would have seven years ago. 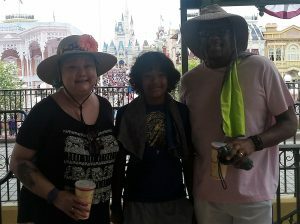 Earlier this month m y family went to Disneyworld. 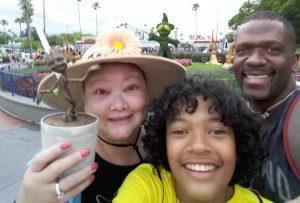 This was a dream vacation for us that I wanted to do without a wheelchair. Not only did I not need the wheelchair, but I ended up walking 56 miles in one week! It was the vacation of a lifetime. So while I have had many, many struggles, I am do ing okay. I may not be the Dancing Queen I once was, but I am good for at least one dance. I can sing along even if my voice isn’t as strong as it used to be, my heart still is! Your strength humbles me. I am so thankful to call you friend. I hope your journey gets easier. Love you! I’m thrilled that you all got to party at Disney. Can’t believe you did 56 miles. Happy happy re birthday ! . Some days seem so fricken long and then I barely blink and a year has gone by. I love your ability to hone on every day frustrations and turn them into a laugh. You are a rock star in my book! It’s May of 2018 and this is my sixth year of being told I had 6 months to live. I don’t always think the doctors know what they’re talking about! I’m glad you’re still around!